Rachel wasn't 100% herself when we were in Georgia. She slept and ate well, but had a runny nose, was drooling, pink cheeks and just "off" from how happy she usually is. 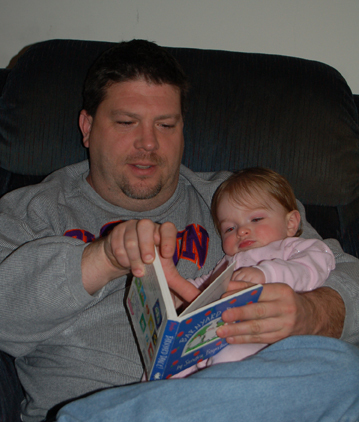 One night while we were winding down and getting books to read before bedtime, Rachel picked out a book and took it to Steve who was sitting in the recliner. She handed it to Steve and said something. He picked her up and the two read Barnyard Dance together before bed. It was a very precious moment.